Putting together a play therapy room or a play therapy kit is part of the fun of being a play therapist and working with kids. And since I’m a mom too, I can use all of these to put together my own kid’s room.I’ve seen a lot of great ideas, many inexpensive, for use in a play therapy room. and wanted to share with you. If you have any other suggestions or links, please share with the rest of us! To get to the original source for instructions, click on the picture! Making a dollhouse from a cardboard box is an inexpensive idea for a portable play therapy kit! Using a dresser as a doll house! You have storage for all the accessories and dolls underneath! More dollhouses made from book shelves!! The last one even rolls for easy portability! This cute DIY sensory table was made from an IKEA nightstand turned upside down with one of the shelves taken out and a bin inserted in its place. Just fill the bin up with sand, beans, water or anything else you can think of for a (somewhat) contained way for your child to play with otherwise messy items. Another DIY Sand Tray, using even less expensive items, including a tupaware box and metal legs. This mom uses rice, but you could also use sand. Display your sand tray items on a wall storage like this! I’m in love with this sand tray room!! I just think it looks beautiful, clean, and inviting. A DIY medical kit from items in your home. Another idea for an inexpensive tool in therapy! A crafty idea to turn an old entertainment center into a play kitchen. A friend of mine made this play kitchen out of an end table! She got the idea from Ikeahackers.net. This picture shows clothes being hung on a ladder, but I think this would be great in a play therapy room to display dress up clothes and takes up less space than some of the other clothing racks I’ve seen! This puppet theater was made from an old book shelf! This theater is made from a foam board and will take up less space and more portable. 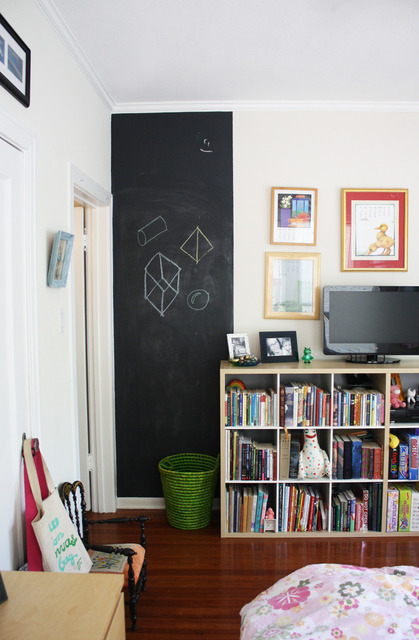 A chalkboard on the wall or behind the door is a good space for drawing but doesn’t take up much space. I don’t have a pirate ship in my play room YET, but I can see how this could be excellent for eliciting therapeutic fantasy play! If you have the room in your play therapy room or child’s room, a teepee would be a great addition and are simple to make. Any kid would feel safe and secure in this small space, yet it is still open enough so they are not hidden from your sight (if you are in a play therapy room). This is about the size of most playrooms and I like the arrangement of the toys. The entire blog post is all about organizing and is worth the read! I like the idea of putting these “boxes” on the wall. I think this would be perfect for displaying sand tray toys, puppets, and other items that sometimes get lost in bins. I like this picture because it shows a small room (most play therapy rooms are small) but it is organized nicely, using a teepee, small table, and flat doll house. This underbed storage unit would be good for keep sand tray toys organized if you are unable to display them on a shelf or doll house items. Glad you like it and Thanks for the comment! Really great collection of ideas. I’m trying to turn my girls new shared bedroom (2 1/2 and 7 months) into a “creative and quiet play” space (i.e. no batteries, screens, buttons etc.) just items that promote either quiet play or imaginative play- dollhouse, sand table, dress up, puzzles, make-believe. Thank you for giving me such great ideas for them to enjoy! Love, love, love the bookshelf into a doll house idea! Previous Previous post: Friday Wrap Up 8-17-12: Must Reads and Best Online Finds From the Week!